If you had told me a year ago, or even six months, that I’d be excited about the growing potential of canned wine, I would have laughed and said I don’t think so. There’s a fair chance my tone of voice would have been condescending. Yes, I would have laughed. And, I would have been wrong. With each review of canned wines, I become more optimistic about this as a category with potential for growth in both market share and quality. It’s clearly time to stop dismissing wines based on their packaging. The most recent example of this steady improvement is “Ah-So,” a new label from Carlos Lopez de Localle, a third-generation producer from Navarra in Spain, and Dustin Chiapetta, a veteran of the wine and hospitality worlds. The Lopez family vineyards are planted with vines ranging from 15 to 45 years old, on predominantly clay and limestone soils. The annual yield is approximately five tons per hectare, or just short of two tons per acre. The wine is 100% garnacha, and is 100% free-run juice, gathered during a five-hour gravity press. This is not a saigneé, where juice is bled off from a press to intensify the character and concentration of a subsequent red wine. Rather, these grapes were farmed intentionally to produce a rosé. The entire vinification process, including an 18-20 day fermentation, is done in all stainless steel in order to preserve the freshness of the grapes. The neat trick to canned wine, I suppose, is that you’re able to enjoy it straight from the can. But, if you were to pour it into a glass, like I did, you’d be struck by its brilliant cherry red color. 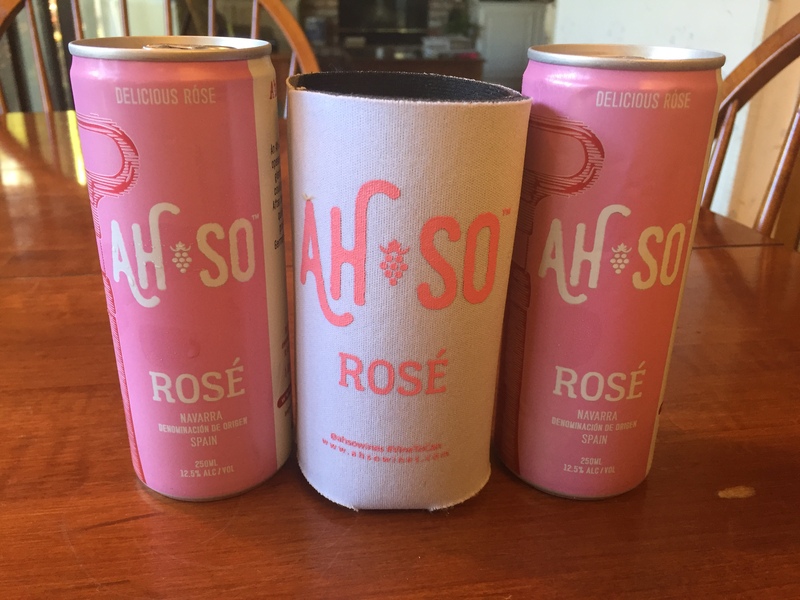 Cans keep the wine well chilled so any aromas you go looking for will be muted at first, but will show up if the wine is given a chance to shake off its cold open. On the palate, you’ll enjoy bright cherry and berry flavors, along with fresh, mouth-watering acid, and pleasant, soft tannins leading into a medium finish. The wine shows impressive balance and concentration. As the wine gets closer to ambient temperatures, it reveals increasing complexity, a soft, almost lush texture, and several more elements that invite your attention. In full bloom, this wine offers more than many rosés carrying steeper price tags. I have not tried this one, but I share your cautious optimism re canned wines! I have one can left so I’m gonna give it another look soon. I was surprised by the quality, actually; how tasty and balanced it was. You know, like real wine and all that. Weird. Thanks for reading.